Connie leads a double life. During the week, she is an up-and-coming designer and dressmaker, creating sleek, elegant gowns for the wealthy elite. But come the weekend, Connie becomes Lady Constance, a member of the House Felicitous at the local Renaissance Faire, creating beautiful historical garments for herself and her friends and teaching dancing to fair attendees. Fearing loss of business should her stylish clientle discover her extracurricular activities, Connie keeps her professional life and her faire life carefully separate. However, everything changes when she’s saved from certain death by Sir Justin: a rising star in the joust and an actual knight in shining armour. Behind his mask as Sir Justin, Dominic is confident and charismatic, but out of his armour, his courage fails him, and to his own horror he finds himself accidentally pretending to be his own best friend. Suddenly, he is in Connie’s life as two different men: the elusive Sir Justin who courts her over the internet and from behind a suit of armour and Justin’s best friend Dominic who hangs out at her apartment and helps her move. The lie only grows bigger and Sir Justin finds himself faced with the most frightening challenge he can imagine: extricating himself from his lie and winning Connie’s heart as his true self. But there’s something rotten afoot at the Faire, something that threatens its future, the community that has grown there, and even Sir Justin’s life. Will Lady Constance find the courage to step up and risk everything to defend her friends, save the Faire, and rescue her knight? 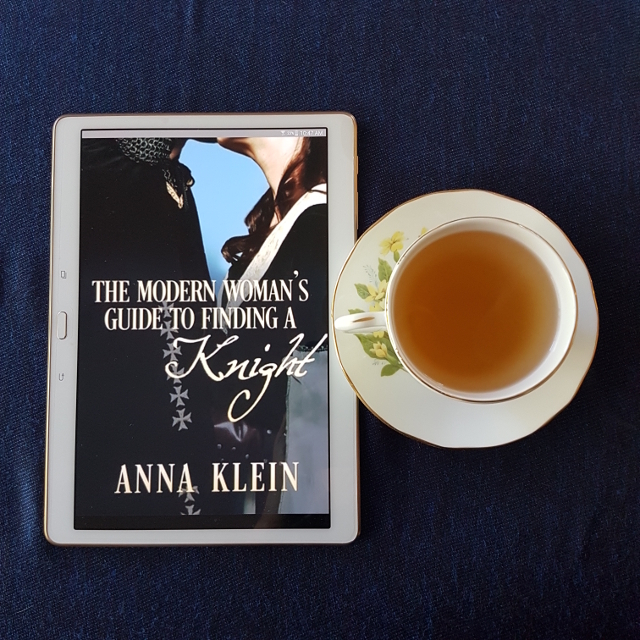 The Modern Woman’s Guide to Finding a Knight is a fluffy contemporary romance that managed to be a little too contrived for my taste. It’s a story that’s sweet more than substantial. The romance between Connie and Dominic is a chaste one, with very little heat and only a few modest kisses towards the end. Instead, they mostly admire each other from afar by chatting via email and IM or with Dominic’s suit of armour or his guise as Sir Justin’s best friend between them. I enjoyed the big romantic gestures, such as the exchange of tokens between the knight and the lady prior to the jousts. However, once the barriers between them have fallen away, I was left with the feeling their relationship didn’t have a lot of depth. The characters also felt pretty shallow, with the villains seeming a bit moustache-twirly, literally looking to be kings of their own small kingdoms. It was nice to see a strong-minded older woman in Connie’s wealthy client Joanna, but her preoccupation with her philandering husband felt more contradictory than complex thanks to its lack of nuance. Despite this lack of depth from the characters, the friendships were a highlight of the story for me. I particularly enjoyed Dominic’s friendship with Lucas. The banter between them felt natural and I enjoyed the way Lucas supported Dominic even while berating him for being an idiot. There was a similar dynamic between Connie and her friend Claire. A strong theme of the story was to do with not being ashamed about the things you love, so it was nice to see Claire calling out Connie on that issue. There were some turns of phrase that made me cringe, such as when Connie describes a perfume she doesn’t like as ‘Oriental’. In that same scene, she imagines Joanna’s husband with “a hateful, deformed visage”, playing into some ableist stereotypes. Then, later, one of the characters is noted as being (temporarily) wheelchairbound. These faux pas did nothing to endear the story to me. Overall, The Modern Woman’s Guide to Finding a Knight wasn’t my cup of tea, despite having some nice moments.